As you guys know, I LOVE makeup. As a former pageant girl I have been obsessed with makeup since I was born. I’m pretty sure I stepped out the womb with my face done in full scale pageant-MissUSA-Texas-style makeup. So imagine how I excited I was to attend a launch party for a new gorgeous set of makeup brushes from Royal & Langnickel. 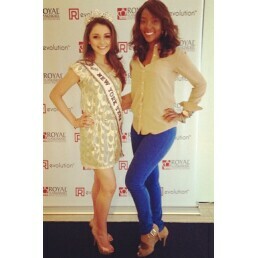 Speaking of pageants, Miss New York Teen USA was on hand for the makeup brush launch. I was so excited to see her! As soon as I saw the blinged out New York Teen USA sash and crown I had to stop her and talk to her. Such a sweet girl. I'm rooting for you at Teen USA Sabrina! Also on hand at the party were a set of terrific artists who were painting exquisite pieces of art for the guests. Side note: how beautiful is that view in the window? It was really breathtaking. I'm sure it made for great inspiration for the artists. Emmy Award winning makeup artist Kevin James Bennett was on hand to discuss the fabulous new Royal & Langnickel makeup brushes. Kevin enthusiastically told us how great the makeup brushes were and how contrary to other brushes in the market, the Royal Brush actually replicate natural hair. And guys, I felt the brushes, they are ahhhhmazing. Not to mention the price point is great- they are about the same price as Mac brushes, that is nothing short of brilliant. 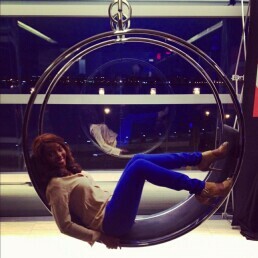 Makho in a FAB chair at the event. How great is that background? The crowd at the event was filled with an eclectic, fashionable and beauty savvy set of folks. 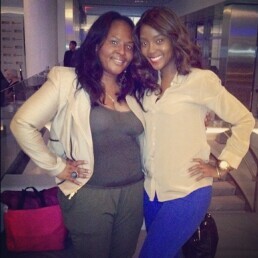 I was so glad to run into the editor of one of my favorite magazines the beautiful Miss Paula Trenfroe. Paula is so sweet and down to earth, make sure you pick up the current issue of Juicy with reality TV bad girl Evelyn Lozada on the cover. 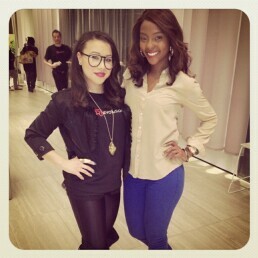 I also got my makeup touched by by makeup artist Raedawn and I loved it! She used the Royal Brushes on my face to to apply the makeup and I was definitely sold on the Royal brushes. The brushes launch online on Monday and will be available at retail stores later this year. Will you be buying them?